Paying Ready Attention: ......and through the middle. History and geography often seem to be unfair to the siblings of the famous. Einstein may have had a brilliant older sister for all I know, Bob Dylan’s younger brother may have been gifted in ways that will remain forever hidden. The bright flame of fame does not always illuminate those who stand close to the source of the light; rather it can cast a darker shadow. Uluru does this to it’s geological sibling Kata Tjuta – it draws all the attention away and casts a very long shadow. But if you look away from the light, you see something even more remarkable. Uluru is an icon – like Sydney Harbour Bridge and the kangaroo - bound to the world vision of Australia through repetition and the failure of advertisers’ imagination. You can’t sum up a country, much less a continent, in just a few objects. There is always something else to find, something else that tells a different story. I don’t know when I learnt to recognise the outline of Uluru – or Ayers Rock, as I would have called it - but it was a long time ago, when even the possibility of visiting Australia seemed as distant and far removed as the country itself. But some pictures and words stick in your mind, and while they may be out of synch with the author’s original intent, they take on a reality of great strength. In The Songlines, which I read as a student, I encountered the image of “men in shorts and long white socks, stepping in and out of Landcruisers”. And since I read that, it has been part of my idea of central Australia. 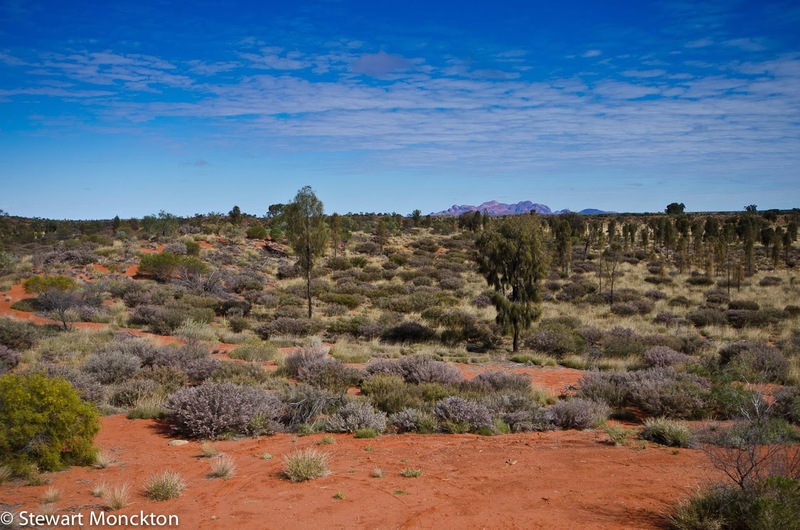 It was the best part of 20 years ago when my internal vision of central Australia collided with the physical landscape. There were Landcruisers, but no white socks. There was the huge blue sky and the ever-present red soil and dust. There was the almost alien bulk of Uluru. And then, as an unbidden surprise, there was Kata Tjuta. It supplanted, but did not remove, all the other images and ideas I had of what this place was like. It remains central to whatever story my mind tells of central Australia. 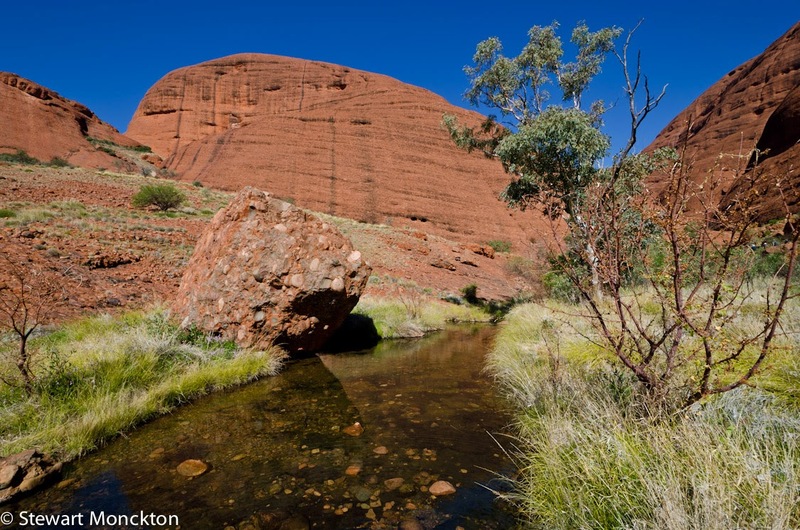 Kata Tjuta bubbles out of the surface to form a complex of rounded domes and heads, split from each other by steep sided valleys that echo to even the gentlest whisper. The stone that builds the domes contains hidden secrets – buried boulders and smaller rocks held firm within a finer matrix – a fruit cake of a mix, different to the fine grained, iron coated, victoria sponge of Uluru. The complexity of base form seems to extend out from the stone itself, toward the domes and heads and then beyond into the very air that sits tight and still around them. We may have been walking to the Valley of the Winds, but there was little movement. Just away from the car park there is a familiar, childhood, noise in the bushes. The kids don’t notice it, but I do. Theirs is a different childhood. It’s the sound that used to escape from my grandmother’s best room and from a cage in our house as well. I hear budgerigars; a complex mix of mechanical chirps and more musical notes - any transliteration would be heavy of T’s and Z’s and light on vowel sounds. The source of the sound is not easy to find. Colours that seem gaudy in the cage break the bird into hidden fragments in the field; colourful but camouflaged. The birds depart and so do we. A rough paved path leads away from the car park and skirts under the steep red stone cliffs. The landscape is built of stone and dust; it feels as if the plants have just been set down in random location. Places that look like they should gather water are bare of growth, while others – looking blasted and baked – are dense with thorny looking shrubs. Maybe a temperate weather mind, brought up with rain and damp woodland misreads the landscape. Every so often I stop to rub my ankle to try to take away a sharp pain– a week later my doctor declares it a Webber B fracture. All I know is that it did not like being moved sideways. I walk in slow straight lines, and pay great attention to where I put my feet. 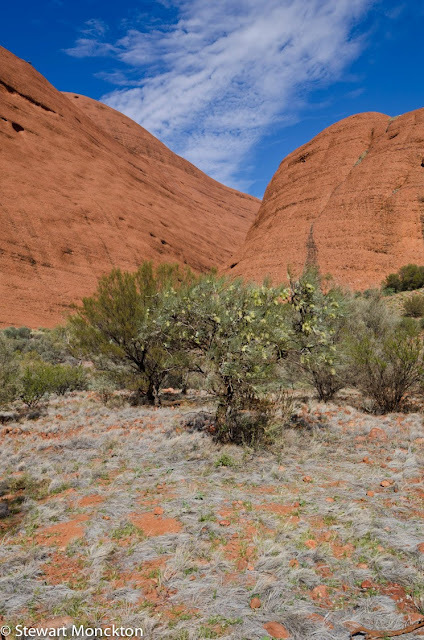 The path leads us behind the main mass of Kata Tjuta, and we start to walk down hill. The kids move quickly. I don’t. Eventually we come to a small stream – which feels out of place but welcome. A short wooden bridge is flanked by old, twisted gum trees. It’s not hot, but the shade is a welcome place to stop, have a drink, take in the views and sample a biscuit (or two). 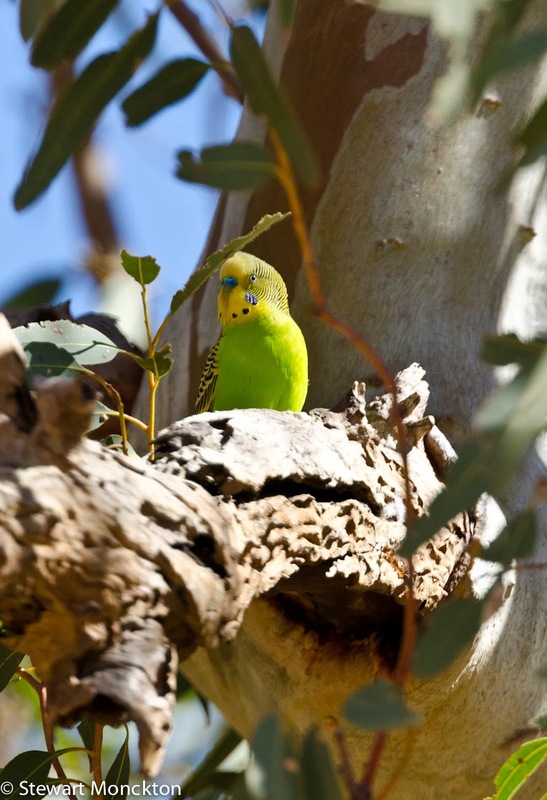 All around are the sounds of budgerigars. 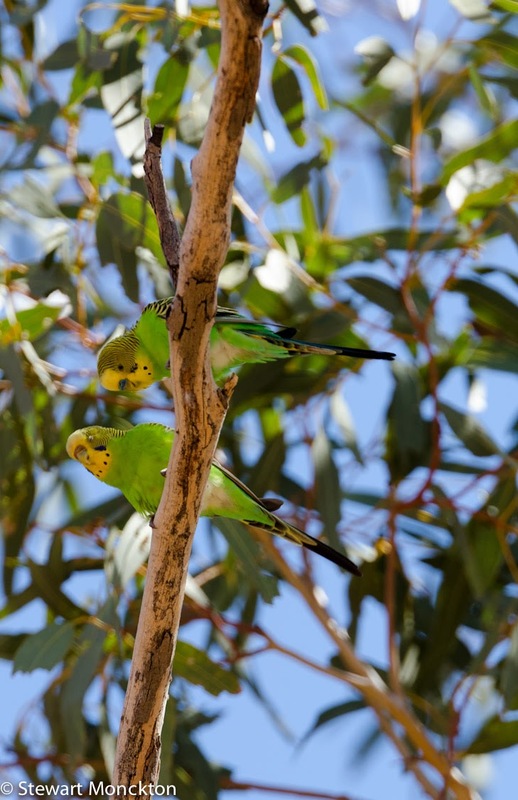 Again they are hard to find, but their discretion may have been due to them doing the kind of thing that generally produces more budgerigars. Birds flicker backwards and forwards between the two large trees, investigating holes and chasing each other; nesting, breeding, finding mates and chasing off rival birds. A little further on we balance back across the stream on well placed rocks and, climbing uphill, we walk back into the heart of the heads and domes that form Kata Tjuta. The rock walls pull steeply up above us, and the heads of the valleys become solid triangles of blue. The almost uniform blue sky and the red rocks form patterns that would seem abstract if they were not real. Again it’s clear that any mind that looked upon these stones would ask “how did this come to be?” – in a landscape like this it’s harder not to be a story teller than to be one. We balance up a rock slab, following the gloss polished by hundreds of other feet and arrive at a flat step. Water pools under the cliff face; thick with green weed and sparkled with bubbles of gas. Even in this solid rock land the process of photosynthesis goes on; light, air and water morph into the solid stuff of plants. I think of the red rust rock; oxygen; the deepness of time. I think of how the tale of the Earth is emerging from the darkness of geological time as we learn to read the story worded into the rocks. Now tells us of then. The past caused by the things that bring the present. A history writ in crystals, in isotopes and fossils. The sun warms the rock and the rock warms me. This is not a place to reject knowing. The rock walls grow taller and steeper, the red dust floor narrower. Even the wind seems to change. On the bridge, below the stream-side trees, the wind was gently talkative, whispering words to the birds, the water and the silent stones. But the narrow valley swallows all of the sound but one – the whistled call of a bird. I think it’s a shrike thrush – but I never see the bird, I only hear the call. The clear whistle echoes off the rocks wall and bounces from side to side, from ear to ear. The location call becomes confused, the bird is everywhere and nowhere. A courting call that lays claim to the whole valley. Somewhere back down the path a voice calls “hello, hello, hello” to make an echo, but the sound dies rather than reflects and it quickly fades down to nothing. The bird calls again and the sound swells and grows, filling the valley. Has the bird’s voice been tuned to the acoustics of the valley? In noisy cities birds are changing their calls to cut through the white noise of civilisation – so why not here as well? A birdcall to cut through the silence and bounce from rock to rock to saying “I am here, this is mine”. We reach the top point of our walk; a saddle. I sit to rub the soreness from my ankle. The kids sit to eat a biscuit and a jelly snake or two. In front and behind the path and the land drops steeply away. To the left and right the ground is steep and bare. The view to the front opens as quickly as the land falls away. Dark in the narrow valley and shimmer bright beyond. More domes crowd the horizon, bleached pink in the eye by the darkness of the viewpoint. The camera fails where the eye succeeds. The downhill path calls invitingly. But my ankle suggests otherwise. The snake eaters agree with my ankle; we turn to walk back towards the bridge and the whispering wind. Two days later we pull back into the same car park. I listen for the budgerigars again, but they are either gone or have become silent. The Sun is low in the sky – is it late afternoon or is it early evening? As we walk up one of the paths a coach arrives. Chairs and tables, champagne and cheese. A civilised view of the sunset on Kata Tjuta. We watch from a different place. The Sun reddens the already red. For once my kids’ hair is the same as the landscape around it. It’s wonderful, but it’s distant. “Stand here please”. People stand in front of the scene for pictures, and we do the same. The rocks become a backdrop rather than a space to walk into. The rocks are over there, rather than just in reach. I can no longer run my fingers over the rough stones. Just down the path the champagne glass chink against each other and bursts of laughter ring just as loud. In the space of a day we have moved from the inside to the outside. I love the place, but I loved it more when I was inside; when we were walking through the middle. HI Stewart I have spend the last hour reading not only this post but your previous one. I don't know why I never got it but now I can piece the whole experience together. The way you have expressed yourself gives us a real feeling for the place. The scenery is amazing. I am so glad you obeyed the sign, 'not to climb'. We certainly could learn so much from the culture and people who lived there. The photo of the red, green and yellow is stunning. I could go on and on but I will stop and just say, these 2 posts should be sent to a magazine for publication. Excellent pieces of work. Kata Tjuta é um lugar mágico! Paisagem agreste, montes avermelhados, céu de azul intenso,belos pássaros, um riacho que parece um oásis. Your prose is evocative and meditative: beautiful! A great post. The photos are beautiful. Oh Stewart!!! That third shot is fabulous!!! What a beautiful area...and so like our Southwest United States!!! Beautiful!!! And how lucky you all are to have such colorful native birds!!! 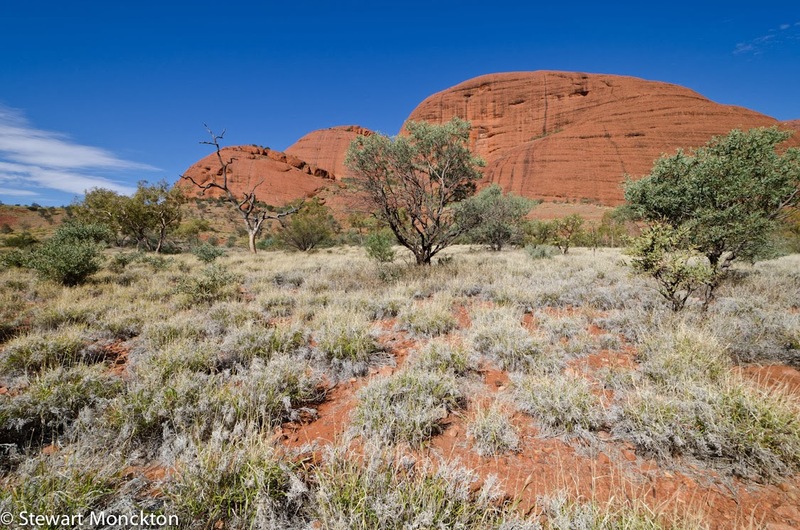 It is so good to read that Kata Tjuta had the same effect upon yourself as it did me - one could truly believe in parallel universes in 'the middle' !! Could not agree more that this is the true gem of the Red Centre. You have make beautiful photos, Stewart! What a lovely place to visit!!! You poor fellow, sore ankles are no fun. It seems unusual for me to see budgies outdoors! Our climate would not be kind to them! Today it is 5 C. and going down from there! I love your journey, painful though it was. Amazing sights. Thanks for sharing them. Beautiful- I believe I would have preferred the middle too!